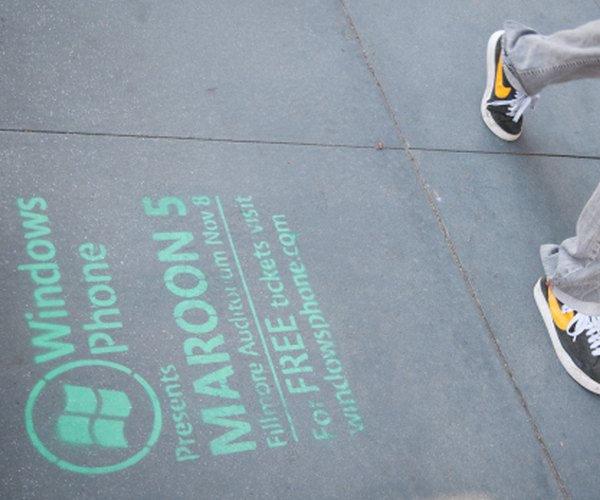 In case you have forgotten, chalk stenciling on sidewalks to promote two concerts that Microsoft was hosting in support of the Windows Phone 7 launch was found in both NYC and San Francisco. There was a small problem: the stenciling was illegal in San Francisco, and Microsoft’s normal PR firm said specifically last week that they were not aware of the acts. That didn’t jive with us. Obviously Microsoft was behind the stenciling, why not cop to it? Oddly, this was sent in via Waggener Edstrom Worldwide, the same PR company that previously denied knowing anything about the graffiti. Whatever the possible innuendo that we could draw, Microsoft needs to get to removing the chalk, as they are wrong in thinking that rain will do it for them. The City of San Francisco said late last week that the city will request the company clean up the stenciling, a city official said. “There was no permit issued for this, because it’s not legal,” said Christine Falvey, director of communications for the city’s Department of Public Works. Falvey said last week that she had not yet heard of the campaign, and asked for photos from MissionLoc@l so that she could contact Microsoft and request that it remove the stencils if the company is responsible. “As a first step, we generally contact the company and rely on them for a cleanup. If not, we can bill them for any cleanup costs the city incurs,” Falvey said. Mike Hernandez, a 25-year-old New Yorker, contacted Mission Loc@l and said he was arrested in June while making similar guerilla-style ads for Attack!, a marketing firm with offices in New York, Los Angeles, Boulder, Colo., and San Francisco. We have not heard of any arrests taking place, but Microsoft really should get on cleaning up their own mess, that the stencils are still there can’t make the locals too happy.